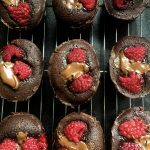 These gorgeous little gooey chocolate cakes with raspberries and Nutella make a stunning dessert for any occasion! I first came across this recipe through one of my favourite food blogs Eat, Little Bird. , who found the recipe via What Katie Ate. These pretty little cakes have been causing a bit of a stir among my foodie circle for quite some time now. Everyone who makes these pretty little cakes seems to love them! I’ve been meaning to try them for months. I finally got around to it this weekend and I can now see why everyone raves about them..they are just delicious. But then I knew I’d love them..raspberries and chocolate are one of my favourite combinations but paired with Nutella? Sign me up for that! I am a complete Nutella fiend. It’s funny though – I can’t eat it on a piece of bread like my children can, but I absolutely adore it in cakes. Or warmed up and drizzled over ice cream. Or just straight out of the jar. You just can’t beat it. 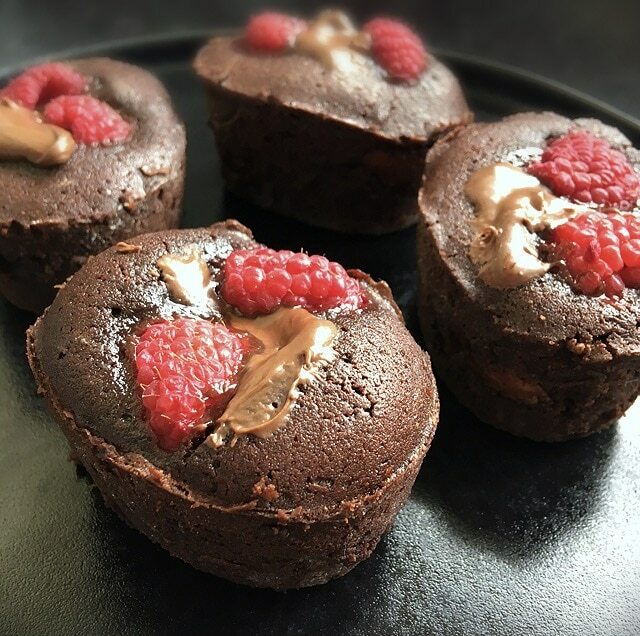 These cakes would make a fabulous little dessert – they are really amazing warm, while the Nutella middle is slightly liquid – when you break open the puddings with your spoon the molten middle pools out onto your plate! A little double cream to pour over your molten chocolate pudding wouldn’t be a terrible idea, or I imagine creme fraiche would also work well. They are just as good cold – I actually love them fridge cold when they take on a fudgy, brownie like texture. There is no bad way to eat them! You could halve the recipe if you wanted to make half a dozen, but honestly….why would you? You won’t regret making the full batch – I promise! 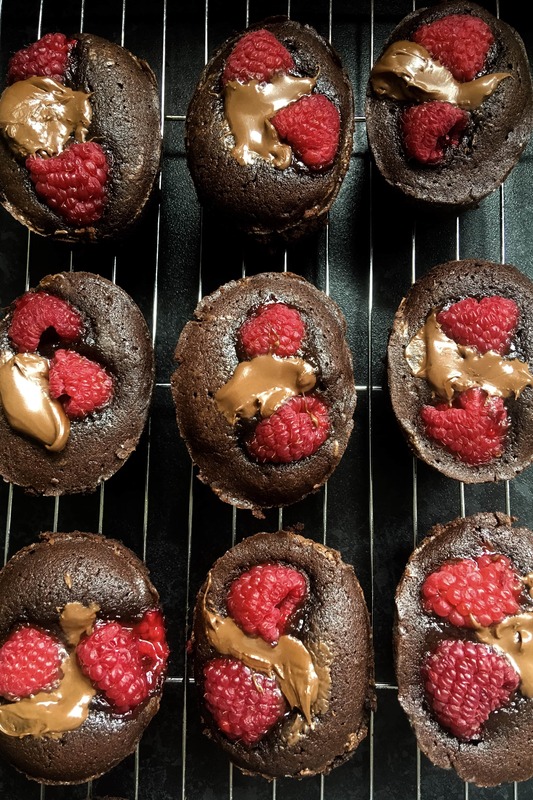 These delicious little chocolate cakes with a melting Nutella middle and fresh raspberries make an absolutely stunning dessert. Preheat the oven to 200C/180Fan/390F. Grease a muffin or Friand tin generously with butter. in a medium bowl, beat together the eggs and sugar until the mixture is pale and thick. Sift over the cocoa powder and flour and gently fold in until the mixture is smooth. Pour over the melted butter and fold in. Place a tablespoonful of batter in the base of each muffin hole, then place a heaped teaspoonful of Nutella on top of the batter. 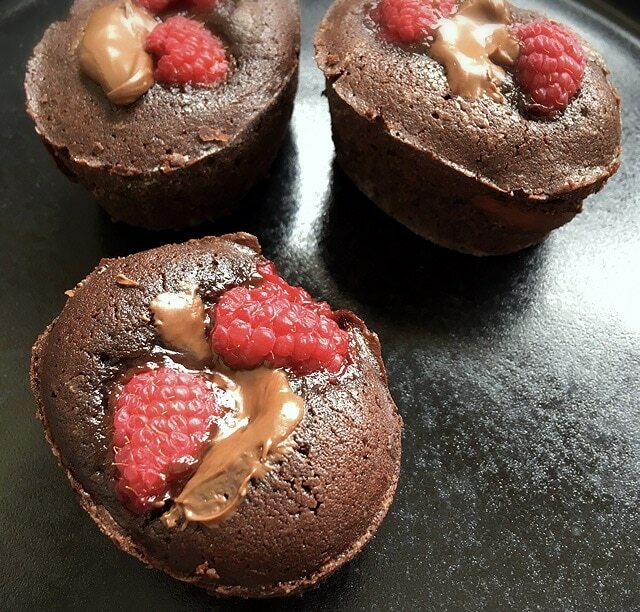 Cover the Nutella with another tablespoon of batter, then place a few raspberries of top of each cake, pushing them slightly into the batter. Bake for about 10-13 minutes, until the sides are baked and the middle is still soft. They might seem like they are underbaked, but don't worry! You don't want to lose that molten Nutella middle. Remove the cakes from the oven and leave to sit in the tin for a few minutes before carefully loosening the edges from the tin with a butter knife. The cakes should hopefully pop out of the tin. Oh wow. What else is there to say? They look heavenly and your photos are gorgeous! These look amazing, Nickki! I love love love Nutella. Can’t go wrong with Nutella cakes with an oozey center… omg yum! I agree they are definitely to be made again and again and again and again….. 🙂 great photo! I’m not sure whether to revise my policy never to have Nutella in the house, or whether to say thank goodness I don’t have it ! They look luscious ! Thank you 🙂 I feel the same way about Nutella, I love it TOO much! OH MY GOSH… cannot wait to try these! 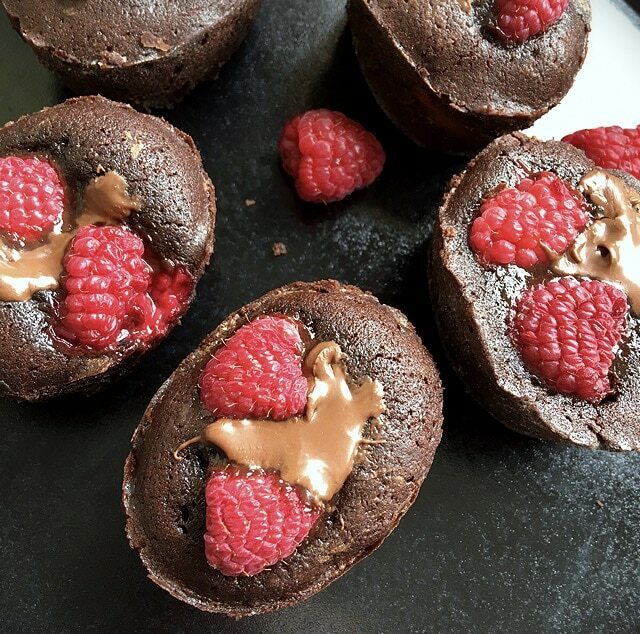 Raspberries & chocolate together – heaven! I have just devoured one and I think I might be in love.